Poly-300-S™ has a 100% polyester jacket with a high grade single ply extruded EPDM rubber lining. This hose is totally immune to the effects of mildew. 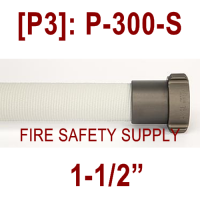 It is designed for Emergency Fire Protection with water pressures not exceeding 135 PSI per NFPA 1961. 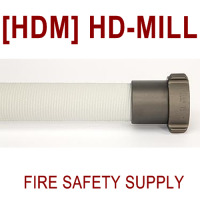 The hose can be purchased plain white or with the optional Ultra-Shield™ which coats the outside jacket thoroughly, impregnated with a high tech polyurethane that is both abrasion and moisture resistant. The hose is Made in the USA. See the Ultra-Shield™ section for optional available colors. Until the mid-19th century, most fires were fought by water transported to the scene in buckets. Original hand pumpers discharged their water through a small pipe or monitor attached to the top of the pump tub. It was not until the late 1860s that hoses became widely available to convey water more easily from the hand pumps, and later steam pumpers, to the fire. In Amsterdam in the Dutch Republic, the Superintendent of the Fire Brigade, Jan Van Der Heyden, and his son Nicholaas took firefighting to its next step with the fashioning of the first fire hose in 1673. These 50-foot (15 m) lengths of leather were sewn together like a boot leg. Even with the limitations of pressure, the attachment of the hose to the gooseneck nozzle allowed closer approaches and more accurate water application. Van der Heyden was also credited with an early version of a suction hose using wire to keep it rigid. In the United States, fire hose was introduced in Philadelphia in 1794. This canvas hose proved not durable enough and sewn leather hose was then used. The sewn leather hose tended to burst so the fabricated of leather fastened together with copper rivets and washers was invented by members of Philadelphia’s Humane Hose Company. Around 1890, unlined fire hoses made of circular woven linen yarns began to replace leather hoses. They were certainly much lighter. As the hose fibers, made of flax, became wet, they swelled up and tightened the weave, causing the hose to become watertight. 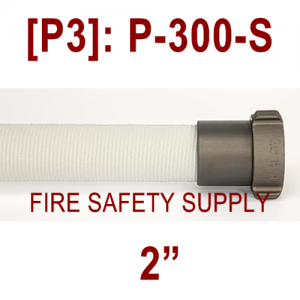 Unlined hoses, because of their lack of durability, were rapidly replaced with rubber hoses in municipal fire service use. It continued to be used for use on interior hose lines and hose racks until the 1960s, and is still used in some areas for forestry applications. Following the invention of the vulcanization process as a means of curing raw soft rubber into a harder, more useful product, the fire service slowly made the transition from bulky and unreliable leather hose to the unlined linen hose, then to a multi-layer, rubber lined and coated hose with an interior fabric reinforcement. This rubber hose was as bulky, heavy, and stiff as leather hose but was not prone to leaking. It also proved more durable than unlined linen hose. Its wrapped construction resembled some hose used today by industry, for example, fuel delivery hose used to service airliners.